This time there were no breadcrumbs or bacon, however there was steak, avocado, artichokes and chickpeas. Photo by Joe. WHY: After a friend served it at a dinner, Joe and Sydney have been obsessed with this simple and always delicious salad. 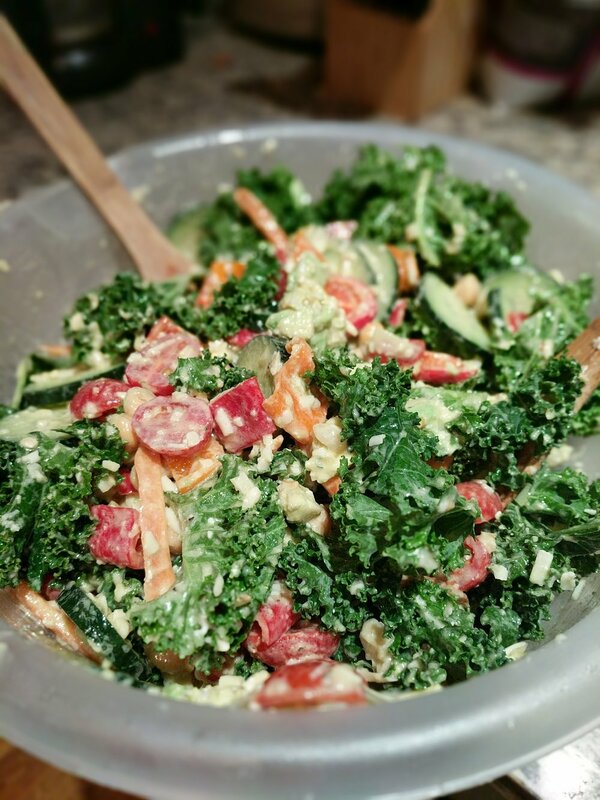 Not only is it a great way to get that vitamin K goodness from the Kale, but thanks to the kale you can dress the entire salad and it will keep for the next day or two. It's usually better! They follow the linked recipe below, but make a few adjustments. Bacon is usually used instead of pancetta. This is due to cost. Sometimes the bacon is skipped all together. Depends on the amount of buffalo chicken they've had that week. Parmesan is used instead of pecorino. Also do to cost but also a little bit due to laziness. If at all possible, don't use the parmesan out of the container (you know, the stuff that isn't refrigerated). Off the block parmesan is always noticeably better. They almost always forget the breadcrumbs and it's totally fine without them. Instead of buying a tin of anchovies, using the 4 that are needed and throwing the rest out, Joe and Sydney grab anchovy paste instead. You'll get probably 5 salads worth of anchovies out of it and it's super easy to store in the fridge. Don't be afraid of the anchovies! Promise you won't taste them. It's usually in the pasta/Italian section of the grocery store. They serve this with salmon or steak. Sometimes pork too! Sydney has been dying to make this with blackened salmon... just saying! Always add in other salad bits for added goodness - chickpeas, cucumbers, tomatoes, carrots, peppers... get creative! At various times they've thrown a bit of avocado, spicy mayo, regular mayo, a little extra lemon juice, a little less lemon juice, or more garlic into the dressing. After you get the dressing down once it's easy (and fun) to adjust to your taste of the day. You want to peel the leafy kale pieces off of the spine and throw the spine away. Not delicious. HOW: Follow this link to get the recipe from Today.com!